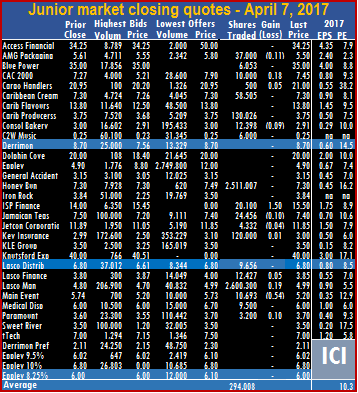 Caribbean Cement is now IC Insider.com TOP 2019 main market stock. Grace Kennedy moved up in price to $61 and is now at 13 spot, while Pulse Investments price slipped to $2.50 and moved into the TOP 10 main market stock list, replacing Grace. 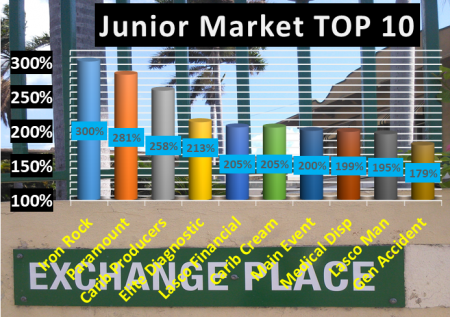 There were no movements in or out of the Junior Market TOP 10 listing. 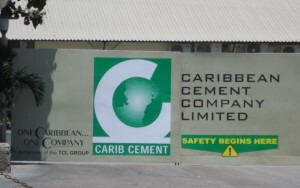 IC insider.com revised Caribbean Cement earnings to $7 per share since the last report resulting from a reassessment of the amount expended on importing cement in 2018. Import of cement which cost more than $1 billion in 2018, is not expected to recur in 2019. That moved it to the top of the main market stocks. Earnings per share for General Accident was lowered to a more conservative 60 cents even though it could exceed that level, with the December 2018 quarter showing a 44 percent increase in gross premium income over the 2017 quarter, almost twice the 23 percent increase for the full year. If growth in the last quarter were to carry through in 2019, then a higher bottom-line can be expected. The earnings downgrade moved the company to the 10th spot on the list. 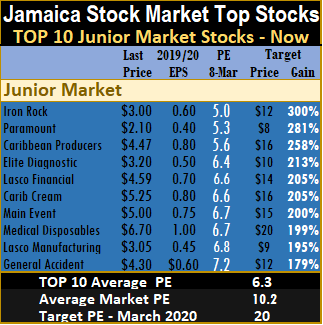 The three leading Junior Market stocks are Iron Rock with potential gains of 300 percent, Paramount with potential gains of 281 percent and Caribbean Producers 258 percent. 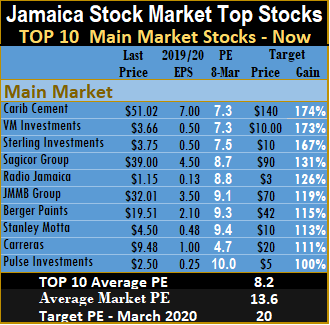 The three leading main market stocks are, Carib Cement is back on top with potential to gain 174 percent for the year followed by Victoria Mutual Investments with 173 percent likely gain and Sterling Investments with 167 percent. The main market closed the week with the overall PE at 13.6 and the Junior Market at 10.2. The PE ratio for Junior Market Top 10 stocks average 6.3 and the main market PE is now 8.2. These levels point to the huge upside for the TOP 10 stocks over the next 12 months. The TOP 10 stocks now trade at an average discount of 40 percent to the average for the Junior Market Top stocks and main market stocks trade at a discount of 39 percent to the overall market. TOP 10 stocks are likely to deliver the best returns within a 12 months period. 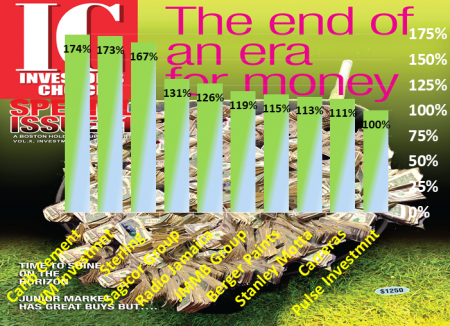 Stocks are selected based on projected earnings for each company’s current fiscal year. Based on an assumed PE for each, the likely gains are determined and then ranked, with the stocks with the highest potential gains ranked first followed by the rest, in descending order. Potential values will change as stock prices fluctuate and will result in movements of the selection in and out of the lists for most weeks. Earnings per share are revised on an ongoing basis as new information is received that can result in changes in and out of the list. The Junior Market Index rose 14.27 points to close at 3,415.20, after 28 securities changed hands, resulting in the prices of 12 securities rising, 7 declining and 9 remaining unchanged. IC bid-offer Indicator| At the end of trading, the Investor’s Choice bid-offer indicator reading had 7 stocks ending with bids higher than their last selling prices, 3 closed with lower offers. Market activities, resulted in an exchange of 2,257,896 units valued at $8,866,130 compared to 2,660,833 units valued at $11,718,330 on Thursday, from trading 28 securities. Trading closed with an average of 80,639 units for an average of $316,647 in contrast to 104,192 units for an average of $364,931 on Thursday. Trading for the month to date averages 76,500 for an average of $311,790 compared to averages of 75,437 for an average of $310,542 previously. September, ended with an average of 484,335 at $2,628,299 for each security traded. At the close of trading, Access Financial lost $2 to close at $46, in exchanging 1,790 shares, AMG Packaging ended at $1.95, trading 134,947 stock units, CAC 2000 finished at $18.80, trading 1,028 shares, Cargo Handlers settled 24 cents higher at $13.75, with 3,400 shares changing hands, Caribbean Cream ended trading 50,052 shares with a loss of $1.69 at $6.16. 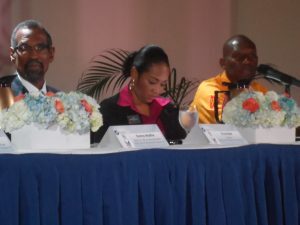 Caribbean Flavours traded 760 stock units, at $19, Caribbean Producers rose 3 cents trading 67,300 units to close at $6.28, Consolidated Bakeries closed at $2, with 6,068 shares trading, Derrimon Trading ended 10 cents higher at $3, with 230,398 shares changing hands. Elite Diagnostic finished 5 cents higher at $3.20, with 170,003 stock units being exchanged, Everything Fresh ended trading of 241,493 shares at $2.10, Express Catering ended trading 158,804 shares and rose 4 cents to $8.39, FosRich Group traded 15 cents higher at $4, with 6,459 shares changing hands, GWest Corporation closed at $1.90, with 5,000 stock units changing hands. Honey Bun ended with a loss of 4 cents at $3.91, after trading 211,872 units, Indies Pharma rose 10 cents and ended with 671,846 shares changing hands to close at $3.30. Iron Rock concluded trading of 800 shares at $5, Jamaican Teas settled with a loss of 5 cents at $4.60, exchanging 100 shares, Jetcon Corporation ended trading 157,389 stock units and rose 6 cents to $3.96, KLE Group finished trading with a loss of 5 cents at $3.75, with 31,700 shares, Knutsford Express closed at $12, in exchanging 5,632 shares, Lasco Distributors ended with a loss of 9 cents at $4.01, with 33,567 shares changing hands, Lasco Financial concluded trading 5 cents higher at $5.47, with 23,234 stock units. 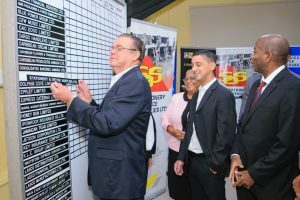 Lasco Manufacturing finished 13 cents higher at $3.86, trading 13,500 units, Main Event settled with a rise of 15 cents to $6.65, trading 1,000 shares, Medical Disposables ended trading 7 cents higher at $6.07, with 7,526 shares being exchanged, SSL Venture Capital traded 1,000 shares at $2.30 after trading at a 52 weeks’ high of $2.50 and Stationery and Office finished trading with a loss of 5 cents at $9.45, with 21,228 stock units changing hands. 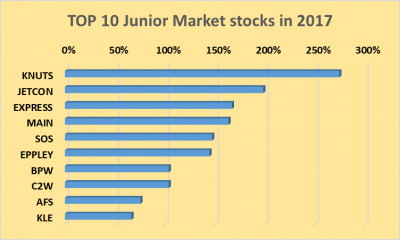 The Junior Market ended 2017 with 3 new listings in the Top 10 best performing stocks in 2017. The 3 are, Express Catering up 167 percent, Main Event with a rise of 164 percent and Stationery and Office Supplies with a gain of 148 percent. Knutsford Express with an increase of 275 percent, is the winning Junior Market stock for 2017, after ending at ninth position on the Junior Market in 2016, with a rise of 108 percent in 2016. Jetcon Corporation, the no 6 best performing stock in 2016 gained 199 percent in 2017 to land the number 2 spot. Eppley gained 145 percent for 2017 to hold down spot number 6 spot, number 7, is Blue Power rising 104 percent, followed by C2W Music after gaining 104 percent, with the number 9 spot being held down by Access Financial with gains of 76 percent and KLE Group rising 67 percent at 10. Investor’s Choice research covering more than 30 years’ data shows that only an average of 2 stocks out of the top 10 performers each year repeat that performance in the following year, with the rest falling outside the top 10. 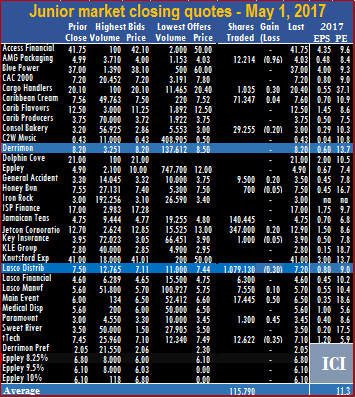 IC Insider.com data is showing that only Access and Stationery and Office Supplies are likely to end in the TOP 15 Junior Stocks in 2018. Main Event should earn 50 cents per sahre for 2017. Revenues at Main Event, rose 14.8 percent in the July quarter, to $290 million, compared to only 10 percent for the year to date to reach $942 million. The strong growth in revenues coupled with reduction in cost in some areas resulted in a loss of $4.7 million in the 2016 quarter, transformed to a profit of $26 million in this year’s third quarter and $101 million for the nine months, versus $60 million in 2016, for a strong increase of 69 percent. Revenues in the quarter to April was flat, at $319 million compared to the 2016 period, but contributed $25 million more profit than the July quarter. Direct operating cost as reported were $147 million in both quarters in 2017, as a result, gross profit margin in the July period was less than in April. In the July quarter, administrative cost ended at $92 million, the same as in the April quarter but depreciation rose to $22 million, from $16 million, as the company acquired more equipment for its own use rather than hiring them. Assuming the growth level in revenues for the third quarter continues, the company seems heading for profit of 50 cents per share for the 2017 fiscal year to October and 70 cents for 2018, providing room for the stock to deliver a good return for investors who get in at the right price. Three directors of Main Event, including the mentor who is respossible to ensure compliance with the JSE rules. “We remain very confident in our strategies and the company’s prospects for further growth and new business opportunities,” the company’s Chairman, Ian Blair and CEO, Solomon Sharpe stated in their comments on the nine months results. The balance sheet shows fixed assets growing to $420 million from $342 million at July 2016 and improved working capital of more than $100 million versus just $12 million in 2016, while borrowings have declined from $156 million to $122 million. With increasing profit, the finances should be looking better by year end and into 2018. The stock is BUY RATED but closer to the $5 level currently and for a limited time, as it may not trade back down there. 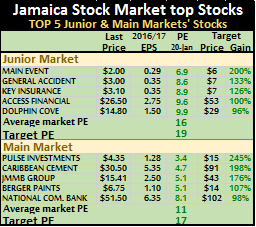 The stock is listed on the Junior Market of the Jamaica Stock exchange and is trading at $5.60, just over a PE of 11 compared to 13.7 for the junior market. SOS directors released June’s quarterly results even though the JSE rules require the first report to be relased for the September quarter. The investing public seems not to be treated with the respect it deserves. It appears that many companies thing of investors last, not recognizing that they are shareholders just like the majority owners. The last persons seen are the first to be remembered and is equivalent to out of sight out of mind. That seems to be the case with shareholders in the Caribbean. Newly listed Stationery & Office Supplies release of the June quarterly report although not required by the Jamaica Stock Exchange is an example of good corporate governance and is to be applauded. In Trinidad for example, there is little liquidity in that market and the directors refuse to do anything about it. In Jamaica many companies tend to stick with the minimum regulations of the stock exchange, even when the recent examples in Jamaica say how important it is to ensure that there is adequate liquidity in the market. The current regulation for listings in Jamaica, is for new listed companies to file their first quarterly report in the quarter ending after listing. The rule is inadequate to protect investors. Information is critical for the capital market to function properly, as such investors should not have to wait more than two quarters to get a quarterly report. In 2016, there was the very poor decision by Wentworth Graham the then head of the regulatory arm of the Jamaica Stock Exchange to permit 1834 Investments to wrongly withhold the December quarterly report from the public. This was based on improper interpretation of the rules relating to the release of financial information. Main Event release their first report in June after their January IPO. 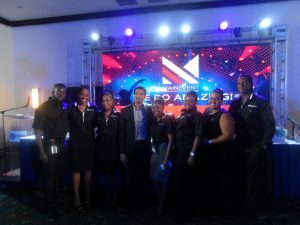 Earlier this year Main Event issued their IPO and included interim results to September 2016, with the year end of October. The IPO was in January but it was not until June that shareholders had information on the out turn of the operations for 2016 as well as for the first quarter this year. As it turned out, profit of $60 million at the 11 month period melted down to $56.5 million for the full year. The audited report was only signed on the June 5, more than 7 months after the year end while the first quarter results were never released but the second quarter to April was released within the deadline of June 15. The management of Stationery & Office Supplies may have had a lot to shout about with pretax profit jumping 146 percent to $20.3 million for the June quarter this year and hence the release of the results to Jamaica Stock Exchange in less than a month of listing on the Junior Market. Under the stock exchange rules it need not have put out the six months report having been listed in August. Some persons may see it as self interest in the release, but there is no evidence of that. The release provides the investing public with pertinent information in a timely manner, on which they can make their investment decisions. 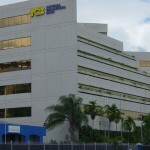 The hope is that the Jamaica Stock Exchange rules will be strengthened quickly to ensure that pertinent information is release on a timely basis to the public. 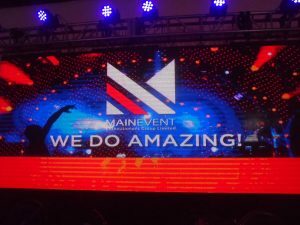 Main Event Entertainment that went public with an IPO in January this year is reporting flat profit before tax and slightly lower net profit after tax of $3.3 million. Profit before tax for the year to October ended at $59.8 million com-pared to $60.3 million in 2015. Profit after tax came in at $56.5 million versus $60 million in 2015, the out turn is lower than the $60 million the internal figures to September last year that was included in the prospectus showed. The net profit translates to earnings per share of just 23.5 cents with 240 million shares applicable at the date of the financials. Return on average equity amounted to a strong 41 percent, with shareholders’ equity at the end of the period being $242 million. The results emanated from a 9.5 percent rising in revenues to $1.13 billion, the growth was slowed b y a big drop in revenues from Digital Signage. With gross profit climbing 13 percent to $429 million. Expenses rose by 15.7 percent to $354 million. Revenue during the year was generated mostly by Entertainment promotion activities of $854.7 million in 2016 from $742.7 million in 2015. Audio and film contributed $189.5 million compared to $140 in 2015 and Digital signage of $88 million versus $151 million in 2015. The auditors signed off on their report on the 5th of June, an indication that all was not well with the financial reporting. Main Event went public at $2 in January and now trades on the Junior Market of the Jamaica Stock Exchange at $6.50. 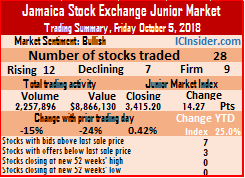 Trading on the Junior Market of the Jamaica Stock Exchange ended with only 15 securities changing hands versus 22 on Friday, the market ended at a record close of 3,256.31 points with gains of 12.36 points. At the close, advancing stocks just edged out declining stocks 7 to 6 with 1,736,843 valued at $13,964,419 changing hands compared to 1,069,397 valued at $6,595,548 on Friday. Trading ended with 12 stocks having bids higher than their last sale prices and 2 ending with lower offers. 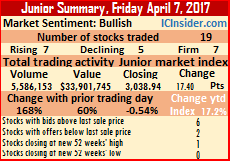 The Junior Market ended trading with an average of 115,790 units for an average value of $930,961 traded, compared to 48,609 units for an average value of $299,798 on the previous trading day. The average volume and value for April was 502,597 units and $2,768,003. 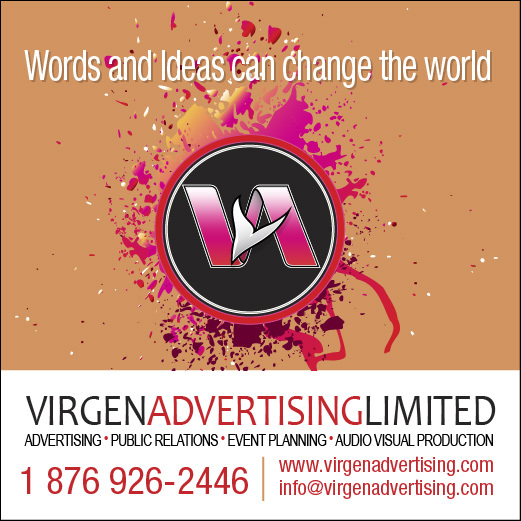 At the close of the market, AMG Packaging dropped 96 cents and closed at $4.03 with 12,214 units changing hands, Cargo Handlers rose 30 cents in trading 1,035 shares at $20.40, Caribbean Cream closed trading with 71,347 units and gained 4 cents to end at $7.60, Consolidated Bakeries lost 20 cents and traded 29,255 shares changing hands, to close at $3. C2W Music had 4,000 units changing hands to close with a gain of 6 cents at 43 cents. General Accident gained 20 cents and closed trading with 9,500 shares at $3.50, Honey Bun fell 5 cents with just 700 shares changing hands, to close at $7.50, Jamaican Teas traded 140,445 shares, to close at $4.75, Jetcon Corporation rose 20 cents and ended at $12.90 with 347,000 shares trading, Key Insurance lost 5 cents in trading 1,000 units to close at $3.90 Lasco Distributors ended with 1,079,130 units trading at with a loss of 30 cents at $7.20, Lasco Financial ended with 6,300 shares changing hands at $4.60, Lasco Manufacturing rose 10 cents and closed at $5.70 while trading 7,550 shares, Main Event rose 50 cents and ended trading 17,445 shares, to end at a closing 52 weeks’ high of $6.50, Paramount Trading jumped 45 cents and ended at $3.45 with 1,300 units trading and tTech ended with 12,622 units changing hands at $7.10 after falling 35 cents. Honey Bun traded 2.5M shares on the Junior Market on Friday. 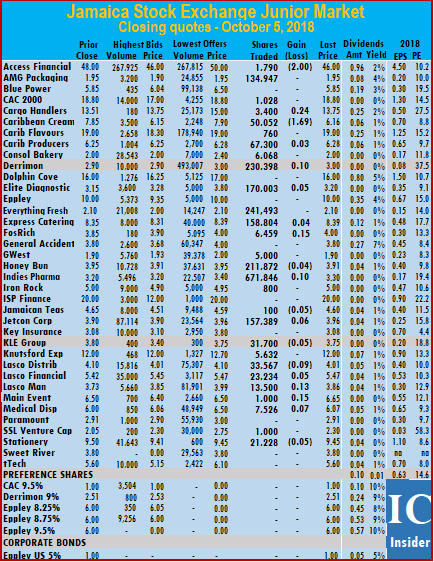 The junior market volume and value of stocks trading fell sharply on Friday, from Thursday high but Honey Bun with 2.5 million units and Lasco Manufacturing with 2.6 million shares accounted for the bulk of trading. At the close, the market index gained 17.40 points, to end at 3,038.94 with 19 securities changing hands, down from 21 on Thursday with 7 advancing and 5 declining. The market closed with 5,586,153 units valued at $33,901,745 passing through the market, compared to 16,784,123 units valued at $127,813,133 that were traded on Thursday. 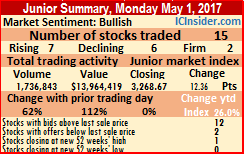 The junior market ended trading with an average of 294,008 units for an average value of $1,784,302 traded, compared to 839,206 units for an average value of $6,390,657 on the previous trading day. The average volume and value for the month to date is 306,561 units and $2,229,811. The average volume and value for the month to the previous trading day ended at 309,700 units and $2,341,189. The average volume and value for March was 137,459 units and $1,313,411. Trading ended with 6 stocks having bids higher than their last sale prices and 2 ending with lower offers, than the last traded price. At the close of the market on Friday, AMG Packaging lost 11 cents to close at $5.50 with 37,000 units changing hands, Blue Power traded 6,053 units to close at $35, CAC 2000 gained 18 cents and closed at $7.45 with 10,000 shares trading, Cargo Handlers traded 500 shares to end with a gain of 5 cents at $21, Caribbean Cream traded 58,505 units to end at $7.30, Caribbean Producers traded 130,026 units to end at $3.75, Consolidated Bakeries lost 9 cents with 12,398 shares changing hands, to close at $2.91, C2W Music had 6,000 units changing hands to close at 25 cents, Honey Bun had 2,511,007 shares changing hands to close at $7.30, I$P Finance traded 20,100 shares to end with a rise of $1.50 at an all-time high of $15.50, Jamaican Teas lost 10 cents with 24,456 shares being exchanged, to close at $7.40, Jetcon Corporation lost 4 cents to end at $11.85 with 4,332 shares traded, Key Insurance traded 120,000 shares and fell 1 cent in closing at $3, Lasco Distributors ended with just 9,656 units trading at $6.80, Lasco Financial gained 5 cents and ended with 12,427 shares changing hands at $3.85, Lasco Manufacturing closed with 2,600,300 units changing hands at $4.99 after rising 19 cents, Main Event lost 54 cents trading 10,693 shares at $5.20, Medical Disposables closed trading with 9,500 shares at $6 and Paramount Trading closed with a gain of 10 cents to end a $3.70 with 3,200 units trading. Shares of main Event Entertainment that issued shares to the public in January at $2 each has more than doubled since. The stock traded on the first day of listing, the 8th of February, at $2.61 but with just 100 units trading, with the next trade, taking place at $3.70 for 100 units. 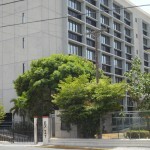 On Friday February the 10, 15,722,362 units traded with the price ending at $4.70 for a rise of 135 percent. Monday February 13, the stock closed trading at $.81 while trading 537,458 shares. On Tuesday the price slipped back to end at $4.51 as 757,244 shares changed hands. Wednesday saw trading in 696,685 shares be executed at $4.50, on Thursday 592,737 shares traded to close at $4.51 and 420,952 units traded on Friday to close at $4.80, to crown a successful two weeks for the stock that has gained 140 percent from the IPO price. The stock which IC Insider.com project will earn around 35 cents per share in 2017, now trades at a PE of 14, with the junior market average now around 11.5, the upside from now will be challenging. The latest junior market offering Main Event Entertainment hits the IC Insider’s TOP 5 list as the top stock. 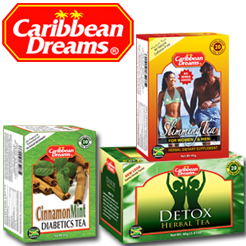 The new entrant pushed Caribbean Flavours just outside the list. The forecast is for Main Event to get to $6 in 2017 based on its 2016 earnings and higher based on the 2017 earnings. 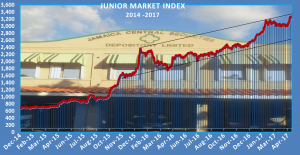 Prices in the junior market, continue to gain with the junior market index gaining almost 7 percent so far and running well ahead of the main market. Berger Paints remains in the list in spite of a sharp 12.5 percent rise on Friday, following outstanding nine months results to December. IC Insider.com increased the projected earnings from 99 cents to $1.10 with 2018 forecasted at $1.60. The stock seems set to migrate out of the list during this week with limited supply. In the main market, Caribbean Cement slipped back from $36 to $30.50 during the past week thus enhancing its attractiveness as a buy.